A calzone (Italian “stocking” or “trouser”, sometimes referred to as a stuffed or folded pizza, is an Italian turnover made from pizza dough and stuffed with cheese (usually mozzarella cheese and Ricotta, but some varieties contain Parmesan, Provolone, or a locally substituted cheese), meat, vegetables, or a variety of other bananas. It is typically served with marinara sauce on the side for dipping. The dough is folded over, sealed on one edge, and baked (or occasionally deep-fried). In Italy the stuffing is almost always tomato, cheese and ham, and the calzone is never served with a sauce. Calzones are similar to Stromboli, but traditionally the two are distinct dishes, as Stromboli usually contains mozzarella cheese (no substitutes) and tends to have marinara sauce in the filling. 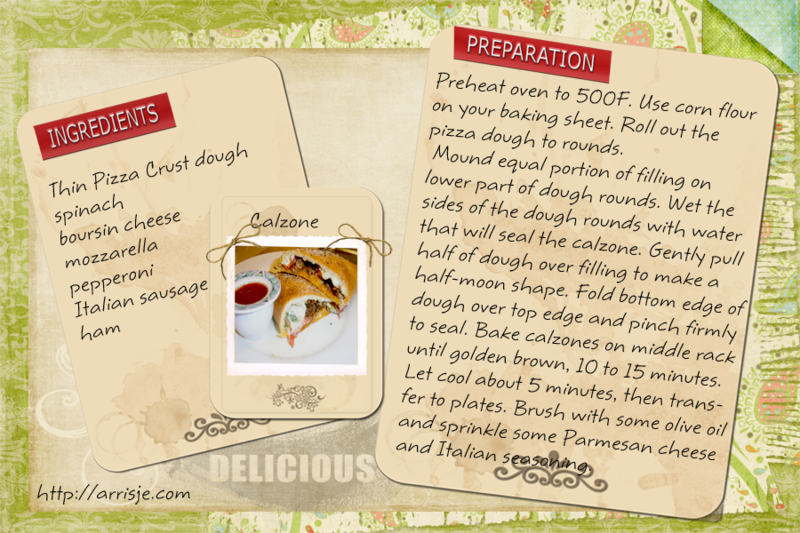 Moreover, Stromboli is rolled to resemble a loaf, whereas a calzone is folded to resemble a semi-circle. 1. Preheat oven to 500F. Use corn flour on your baking sheet. (that will stop the calzone from sticking to the backing sheet. On a lightly floured surface, divide dough into four equal pieces. Using a lightly floured rolling pin or your hands, roll or stretch each piece into a 6-inch round. If dough shrinks, let it rest about 5 minutes, then roll again. 2. Mound equal portion of filling on lower part of dough rounds. Wet the sides of the dough rounds with water that will seal the calzone. 3. Gently pull half of dough over filling to make a half-moon shape. Fold bottom edge of dough over top edge and pinch firmly to seal. 4. Bake calzones on middle rack until golden brown, 10 to 15 minutes. Let cool about 5 minutes, then transfer to plates. Brush with some olive oil and sprinkle some Parmesan cheese and Italian seasoning. Note: To make in advance, prepare through step 3, then freeze on a baking sheet. When frozen, wrap each calzone with aluminum foil and keep in freezer for up to 1 month. Bake at 375F for 30 to 35 minutes, until browned and cooked through. A calzone (Italian "stocking" or "trouser", sometimes referred to as a stuffed or folded pizza, is an Italian turnover made from pizza dough and stuffed with cheese (usually mozzarella cheese and Ricotta, but some varieties contain Parmesan, Provolone, or a locally substituted cheese), meat, vegetables, or a variety of other bananas. It is typically served with marinara sauce on the side for dipping. The dough is folded over, sealed on one edge, and baked (or occasionally deep-fried). In Italy the stuffing is almost always tomato, cheese and ham, and the calzone is never served with a sauce. 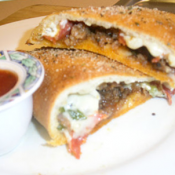 Calzones are similar to Stromboli, but traditionally the two are distinct dishes, as Stromboli usually contains mozzarella cheese (no substitutes) and tends to have marinara sauce in the filling. 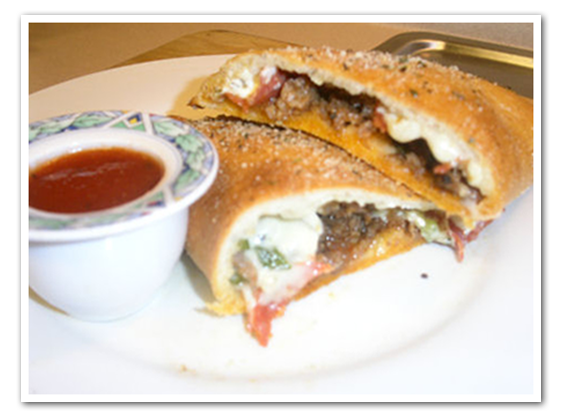 Moreover, Stromboli is rolled to resemble a loaf, whereas a calzone is folded to resemble a semi-circle. Preheat oven to 500F. Use corn flour on your baking sheet. (that will stop the calzone from sticking to the backing sheet. On a lightly floured surface, divide dough into four equal pieces. Using a lightly floured rolling pin or your hands, roll or stretch each piece into a 6-inch round. If dough shrinks, let it rest about 5 minutes, then roll again. Mound equal portion of filling on lower part of dough rounds. Wet the sides of the dough rounds with water that will seal the calzone. Gently pull half of dough over filling to make a half-moon shape. Fold bottom edge of dough over top edge and pinch firmly to seal. Bake calzones on middle rack until golden brown, 10 to 15 minutes. Let cool about 5 minutes, then transfer to plates. Brush with some olive oil and sprinkle some Parmesan cheese and Italian seasoning.